I spoke with Stuart Robertson, the guy that owns the Greyhound station, this morning on radio – I do have audio, which I was planning on posting, but the file was eaten by my thumbstick. So expect that later. Last week we talked about the Mayor’s thoughts on moving the bus station, and there has apparently been enough movement to spark Robertson to create a website against moving it. 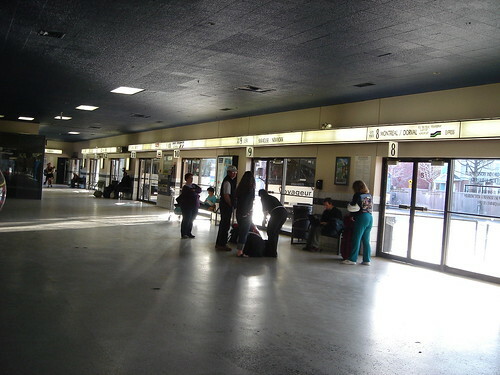 As a matter of background, Mr. Robertson rents the building to Station Centrale, who operates the terminal for Greyhound. This makes sort of a wierd situation, because essentially the landlord is creating a public campaign to pressure his tenant to keep renting space from him. Robertson is looking to make sure that any decision that happens is in public, and “not by just the head of VIA rail”. As I said on air, the bus station is sort of weird in that, as best as I can figure, it is the only organized intercity transportation service where the depot is privately operated, designed, and held. Robertson suggested that zoning by the railyards would facilitate an easy switch of the station (which he thought was a bad thing, given that staff won’t get to study it), but that’s more or less exactly how these things are supposed to work. That puts the bus terminal in a weird grey zone: we might expect public input into its location, but I’m not sure on the surface if we actually have much of a say. I like the bus station where it is, but am not wedded to it. This is mostly because its pretty close to my house. That’s an advantage I have, but I have never taken the bus so frequently that the cab fare would be a big deal. I’m not totally sure what I think about having no inter-city transportation options directly downtown. On the one hand, it makes intuitive sense that you take people right downtown, on the other we are talking about moving the terminal less than 5km away, which really isn’t all that far, save for those that are walking. Ottawa has a pretty compressed downtown core, and many of the people that actually use the bus aren’t going to or from it, so perhaps we are a bit unrealistic about keeping everything there. It’s a good press line, but I don’t really think that this is a decision that rests with just VIA. It would seem that it’s up to greyhound to determine the business case for where there station is located. For all I know they are looking to play potential landlords against each other for a better deal. VIA might make the offer to put a bus station somewhere, but nothing compels greyhound to take it. The Carleton taxi and walking comparison’s on the website are kind of disingenuous, given that a cab fare to the University of Ottawa would be less by the rail station. Also, I doubt that student’s transportation decisions are really determined by a 6 dollar cab difference. More on that: Being on the transitway, the via terminal actually has better bus service at all times of the day than Catherine Street. When I still lived in Nepean, arriving late on the bus was a pain to get home. It’s less so when a 95 comes by, even at 1:30 in the morning. In short: I understand why there might be efforts to keep the bus station where it is, especially from the guy that has a stable and presumably lucrative tenant. But the more I think about it, I’m more and more sure that moving the greyhound station in the not-so-distant future might make a lot of sense. I’m not wedded to any particular location, and I’ve probably thought as much about this in the last couple of days as anyone that isn’t directly involved, but I think that in any conversation we have about this I’m going to end up deciding another location would make sense, especially since all of this has me thinking about what could be done with the Catherine Street terminal if Greyhound leaves.